Back in the day - when Dan and I were still very new and navigating our way from "Just Friends" to True Love - we had a very awkward conversation about Banana Bread. Because in all the years we had talked about our most private feelings and the most intimates details of our lives . . . we had never baked together. Night after night we stayed up late on phones and sofas - talking and playing video games - mostly talking A LOT - but never baking. So years later - I had to ask " Do you like Banana Bread? With Walnuts or Chocolate Chips? Or both?" He looked at me like I was asking about breathing Oxygen and said "Who doesn't like Banana Bread?" . . . I won't bore you with the rest. It really was just a lot of "What kind of Peanut Butter do to you like?" and "Do you butter your toast before you put on the jam?" - You know the conversation. We've all had some version. . . because no matter how well you think you know someone - Till you know what they eat - You will NEVER really know them. This brings us back to Banana Bread. It was because of this conversation and the special role Banana Bread played in our relationship ( the first thing we ever baked together ) and because we had about 7 VERY ripe bananas in the fruit basket - that we started with Betty Crocker's Banana Bread - well muffins really - because there is just 2 of us and muffins are easier to hand out to visitors. We replaced the traditional processed All-Purpose Flour with Organic Whole Wheat Flour ( of course ) and replaced 1 of the eggs with an over-ripe banana and the other with Ener-G Egg Replacer. 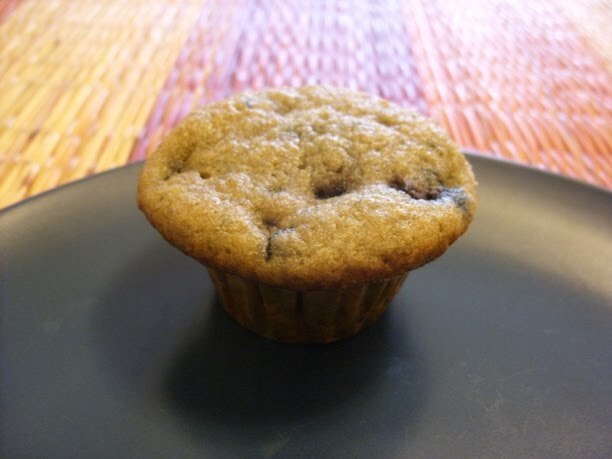 We also went with the Blueberry version rather than Walnuts - using some organic Blueberries from Trader Joe's. I would love to say we started this experiment off with a Fourth of July fireworks display - but this is not a movie. Our first assignment in this experiment was more of a "Way to Go Kid!" banner. They are a bit moist and after a day - the lovely little perfect peaks sunk. 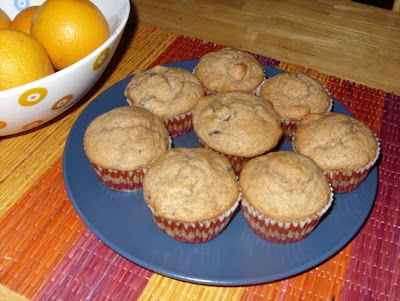 They may have seemed better - if we hadn't actually baked some Chocolate Chip Banana Muffins recently that were pretty fabulous. . . 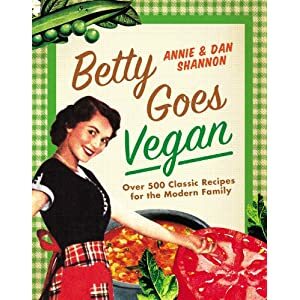 So for those of you looking to make a really good Banana Muffin - Here is our recipe - the one we have used all these years - since that first conversation. With an electric hand-held mixer - mix Margarine and Sugar and then mix in Flour, Baking Powder, and Baking Soda. Add the remaining ingredients and mix - until there are no lumps. Fold in Chocolate Chips. Using a ladle - fill muffin wrappers about half way and bake till the tops are golden and you can pull a toothpick out without any goo on it. maravilloso, poder deleitarse con postres como estos, la vida es maravillosa respetando nuestra hermosa fauna. 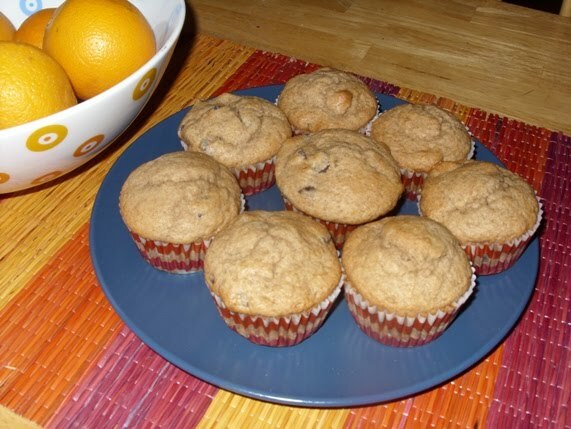 Yumm, these muffins are scrumptious! I just made some to share with my family. I added blueberries to half of the batch and strawberries to the other half. On one plate, these muffins look pretty patriotic.